Below you will find listings of Vending machine companies in GREECE. Types of machines which may include: Snack, Soda, Drinks, Food, Deli vending machines, Amusement games, repair services and more! Please contact the Greece vending supplier direct to find more information about their vending services. POST YOUR COMPANY -Get New Business! 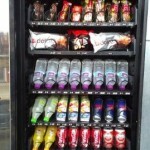 ML VENDING SERVICES – Manufacturer of automatic vending machines for: Coffee, Soft Drinks and Snacks. Athens, Greece. Pieria Vending Machines— We offer Snacks, Beverages, Refreshments in our vending machines- Service Areas in Greece. We have a great range of hot and cold beverages – snacks – refreshments vending machines, which we place into your work room FREE of charge and with absolutely no expense, in order to serve you and your customers. Vending Bar– We provide vending machine sales, service and repair of vending machines, Bianchi, Saeco, throughout Greece.